Picture this: A Swiss owned company looking to market an innovative technology product into the US, a market that was identified with the biggest potential and appeal for these products. 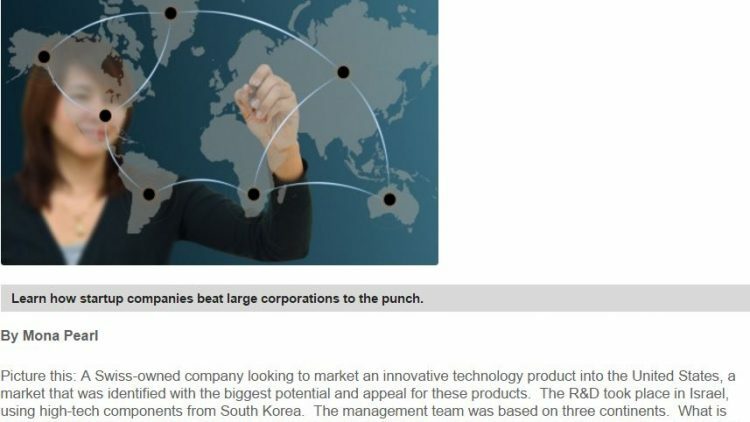 The R&D took place in Israel, using high-tech components from South Korea. The management team was based on three continents. What is different about this scenario? This is a start-up and not a mature company that is looking to grow globally. This is a story about a start-up that was born global. As trade borders become seamless and the world becomes more dependent on technology, entrepreneurship is a major driving force for growth in an increasingly competitive global market. As a result, more start-ups are being born with a global orientation. Technology, coupled with ease and convenience of communicating across borders and time zones, accelerate and encourages visionaries from different parts of the world to team-up and collaborate with others; take advantage of global opportunities and be more in-tune with customer demands. This all results in the creation of new products or services that transcend borders. Rise and shine visionaries and entrepreneurs. This is where future opportunities lie. What do you need to have in place to be global from day one and beat the traditional corporation structure to the punch? Recently, we are seeing businesses which function globally from the moment they start their operations. These companies are born with a global vision and serve global markets and can be called as “Born Global Companies”. The global technology advances and international business competition have given rise to a new entity, the born global company, a company that adopts a global perspective and engages in international business from or near its inception. Many of these companies become international competitors in a very short time-frame, using their nimble structure and global networks. Unlike traditional companies which start their operations locally and expand slowly into global markets, becoming multinational later and then becoming global, born global companies establish a global operation from the very start. Their mission statement, corporate vision, business strategy, organization structure and business operation are all geared towards globalization. The emergence of born global companies is fairly new and is not limited to any country. The first of the born global companies are from developing nations or from nations with small local market. Today this phenomenon appears to be fairly widespread, but very limited in US entrepreneurial circles. Irrespective of the country of their origin, these born global companies share certain common traits.